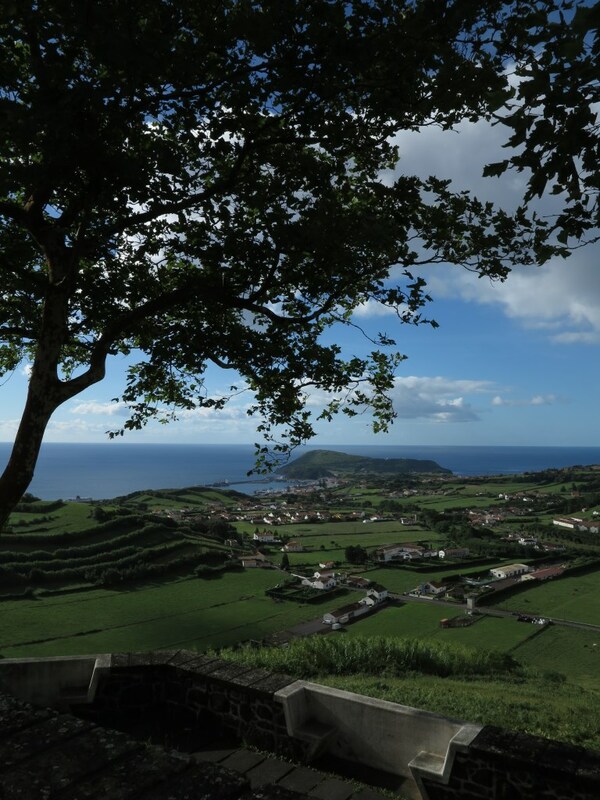 In 2016, we decided to visit the Azores for our main ‘summer’ holiday. This time it was just Mandy and I, which meant less hassle and worrying about finding things for the two (nearly in Ryan’s case) 20 somethings to do. 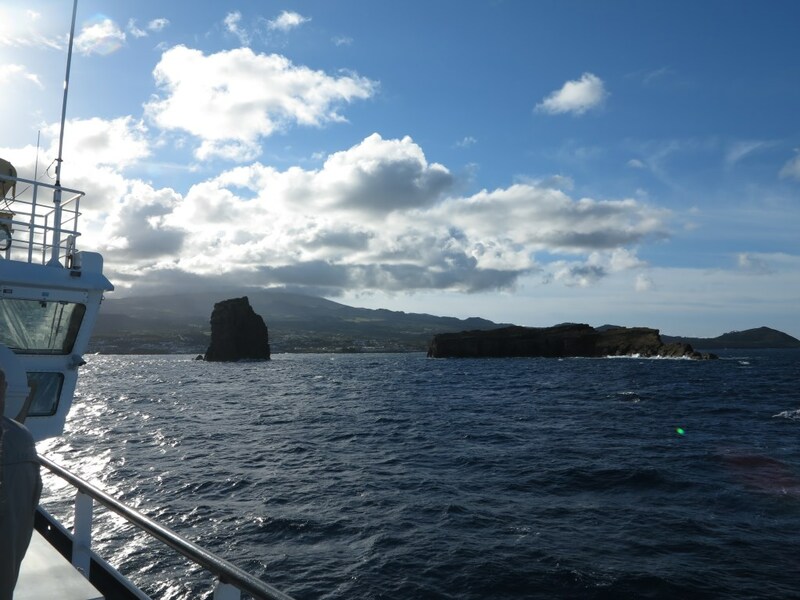 Until I found out there was a chance to dive with Manta Rays there, I knew little about the islands except that they sit in the mid North Atlantic. 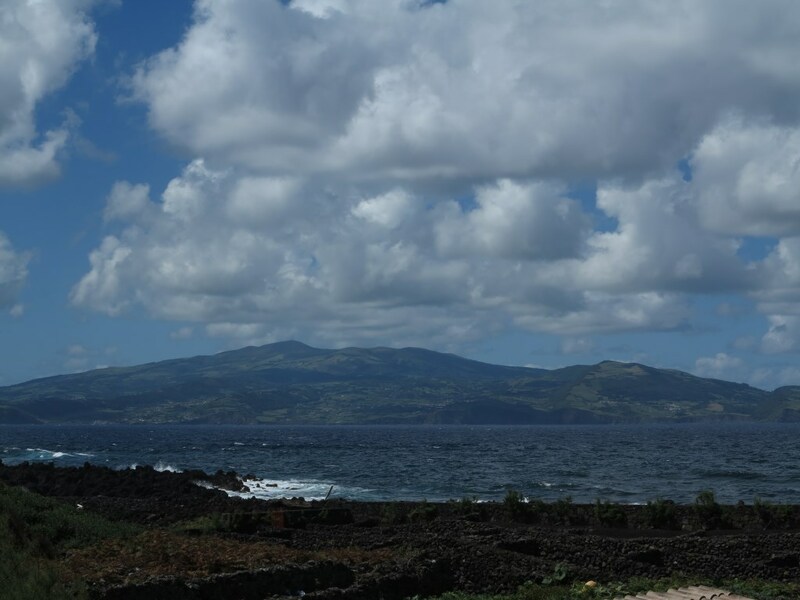 This doesn't bode well for a holiday location, but a bit more research revealed an archipelago of rich green islands made of volcanic rock (some still remarkably active!) and crystal clear blue waters. 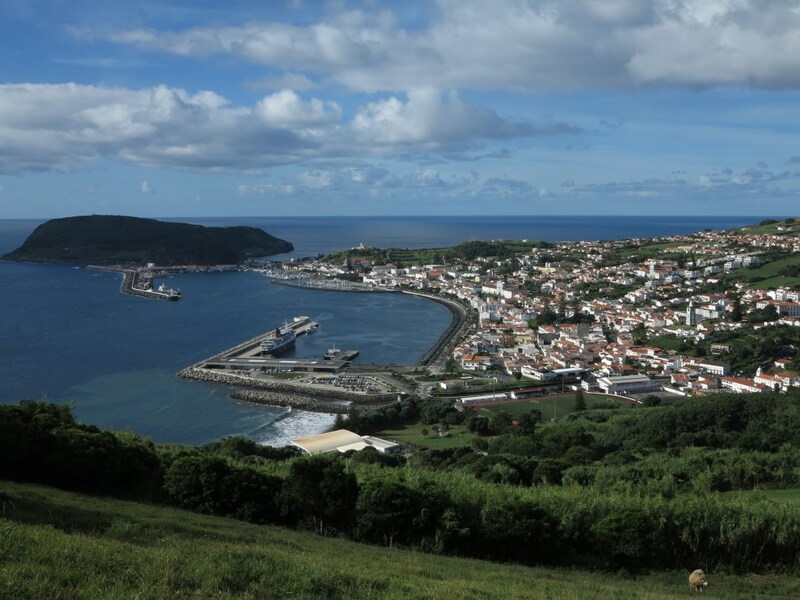 We booked our trip to Faial, the most westerly island, via Ultimate Diving, who specialise in dive trips. 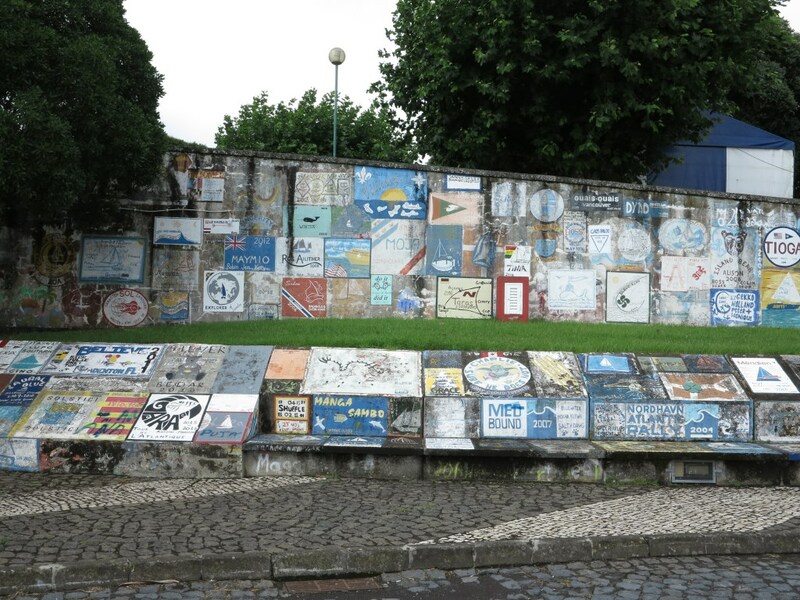 Our journey out was via Lisbon (You can fly direct to Sao Miguel, the largest island, from the UK, but not Faial) and we hung around the quite nice, but not huge airport for 4 hours, not arriving in Horta (at the TINY airport) until around 5:00PM (one hour BEFORE UK time, I can only find Cape Verde on the same time zone!). We were picked up by the cheerful Raquel in an ageing FIAT hatchback and chatting to her we realised she was from the Norberto Diver, the dive centre who I was using. 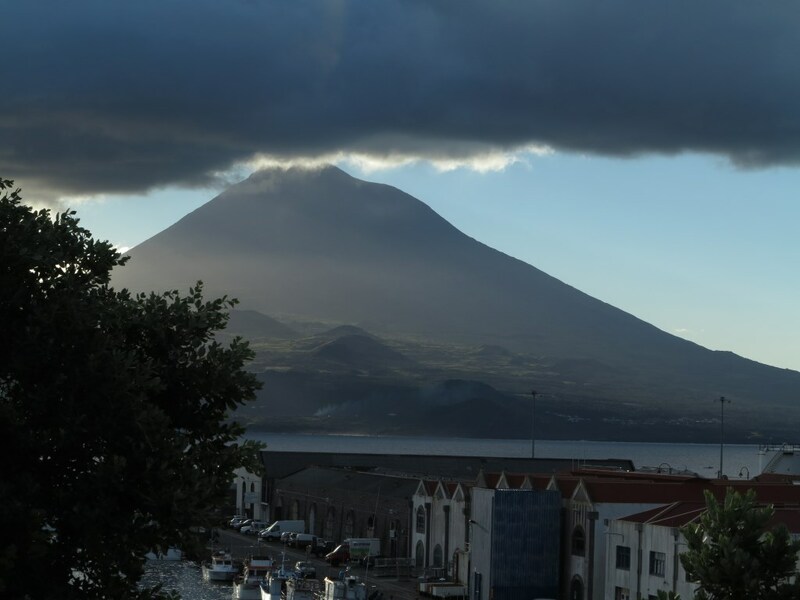 We dropped my kit at their dive centre on the harbourside and she ran us to the, very, nearby Hotel Do Canal where out top floor room DID feature the trademark views of Pico (a massive Cone volcano), although as we arrived as the tail end of a hurricane passed through it was impossible to see! Hotel Do Canal, our home for the week. Dinner (we were on half board) proved very pleasant and our room was clean, reasonably spacious and comfortable - It lacked a balcony, which was a bit of a shame, but we weren't to spend a lot of time there. 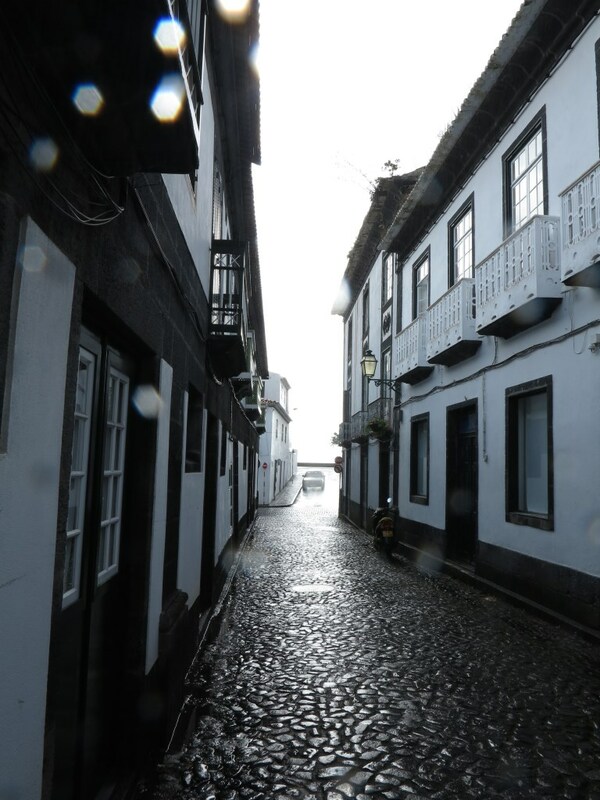 The following morning we explored Horta amidst showers. 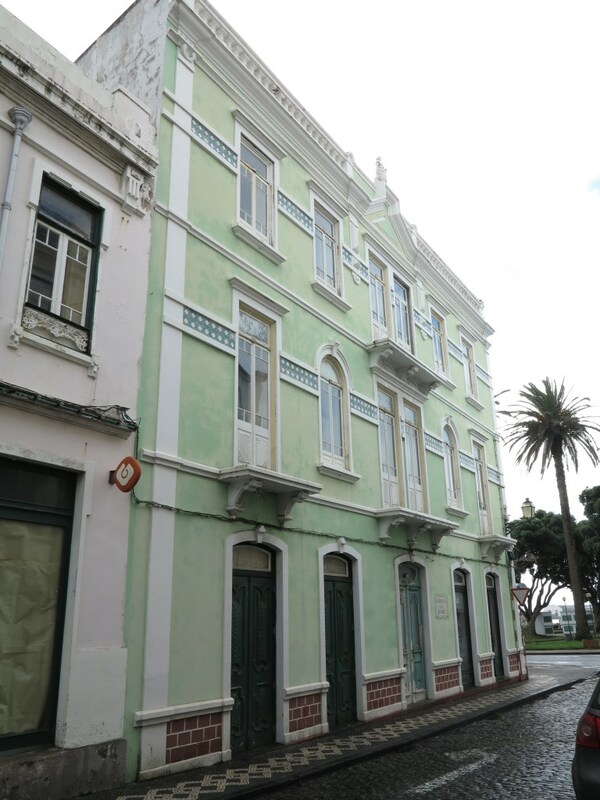 It was, as I suspected from a bit of investigation beforehand, a little like a much smaller, slightly shabby and undeveloped Funchal in Madeira(the architecture sharing Portuguese styles, as both Madeira and the Azores are Portuguese islands). 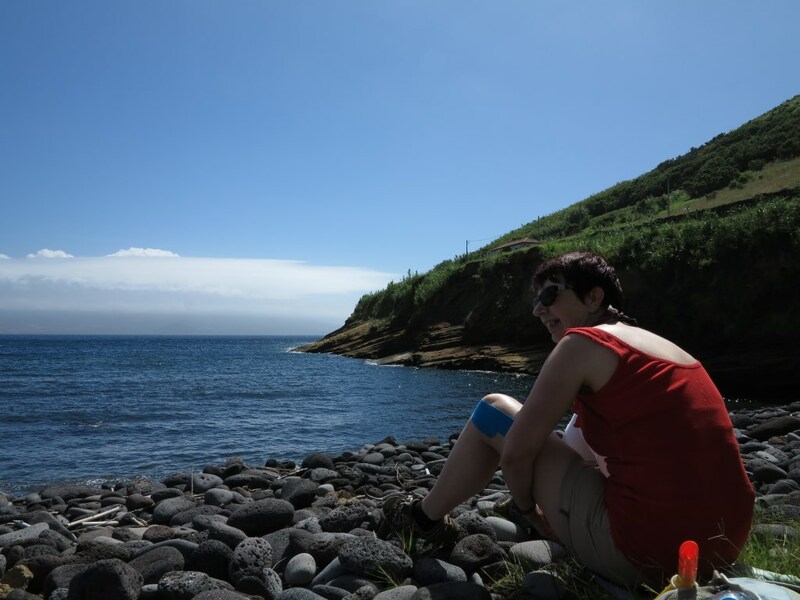 The sun peeked out and we had an ice-cream before I went off to the dive centre and Mandy climbed the hill at the end of the harbour that overlooks the one small beach in Horta. 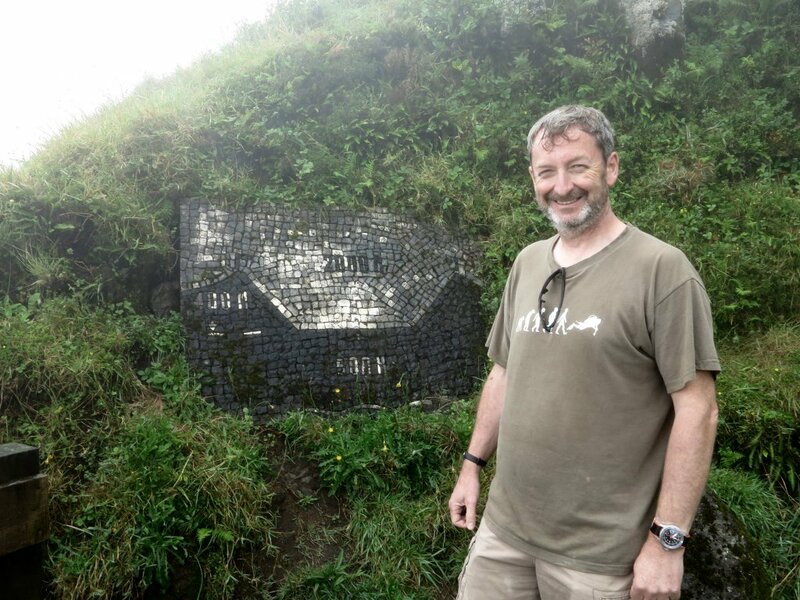 You can read about my diving experiences in the Azores on this page. Dinner was good again (as it proved to be most nights), but the forecast for the next day was not for good weather and this was delaying opportunities to make the longer trips out to sea that had driven my original desire to come to the Azores, so we decided to rent a car for a few days and do some exploring. 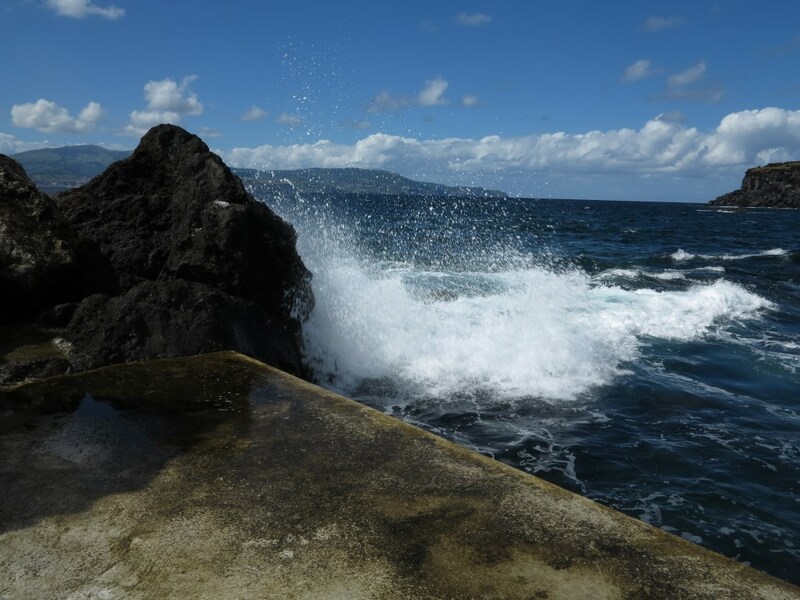 I dived a small wreck on the second morning and then we wandered around to do a small rocky beach to do a bit of Snorkeling, but the stones and a bit of a surge meant we didn't stay long. We then took in the sandy beach, Porto Pim (once home to whalers!) on the other side of the road and had an ice cream in the sunshine before heading back to the hotel. Mandy's leg was feeling sore, so I wandered around town for a while taking photos and had a quick beer on the waterfront. Porto Pim beach, once ran red with Whale blood, now much more pleasant! 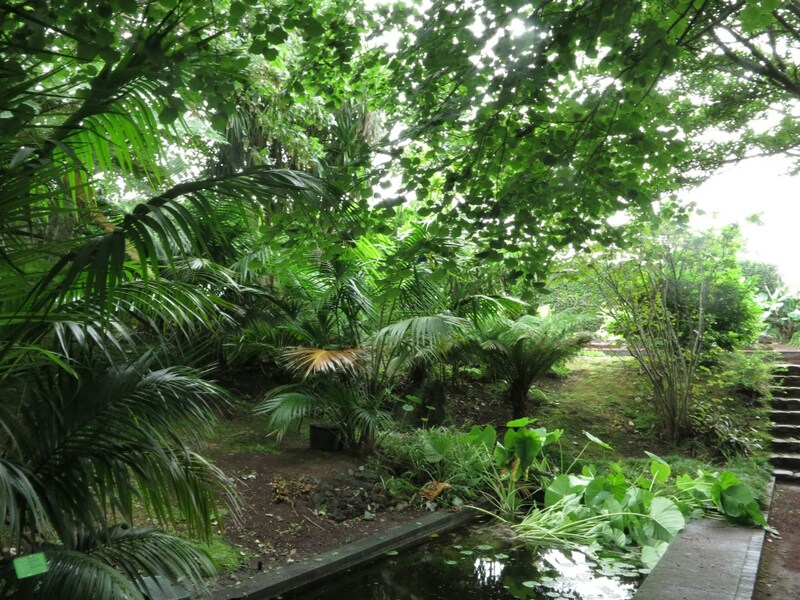 Our initial plan was to visit Pico the next day, but that didn't happen as we couldn't get a Ferry back until late at night, so we delayed that and instead drove to the Botanical Gardens, not at their best at this time of year, but interesting for their areas dedicated to indigenous, native and introduced species. 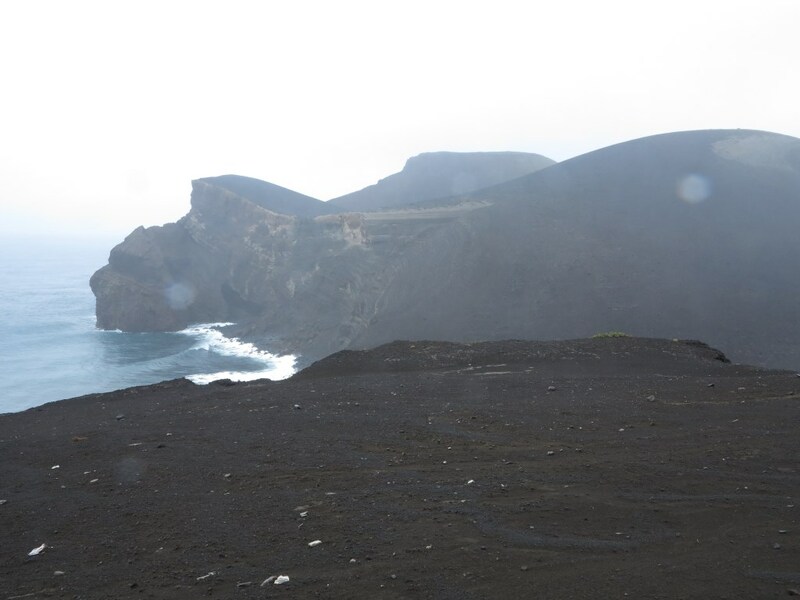 Then we drove up to the caldera, but as we drove up we were in thicker and thicker cloud and when we reached the top (alone), there was no view into the volcano itself, so after a few ironic photos we drove down along some very rough roads to the far side of the island and then back around to Horta. 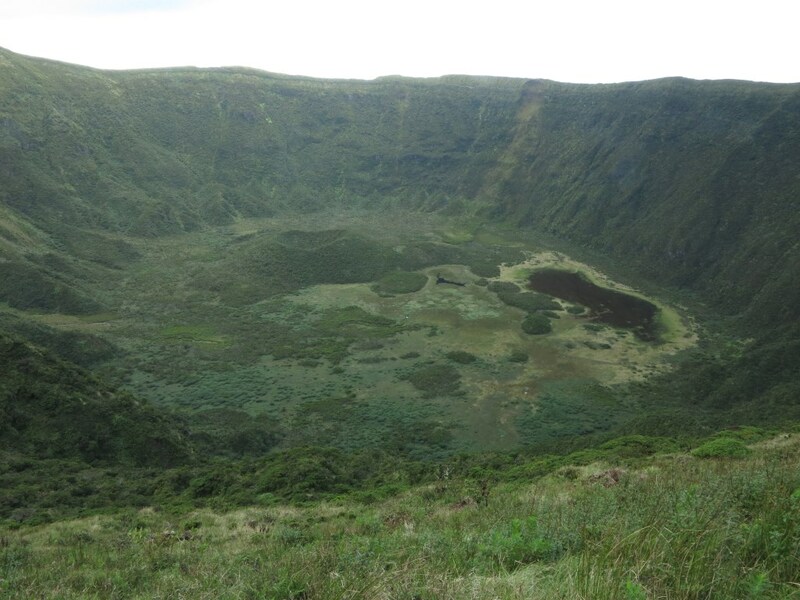 As much of the Caldera as we saw on our first visit! 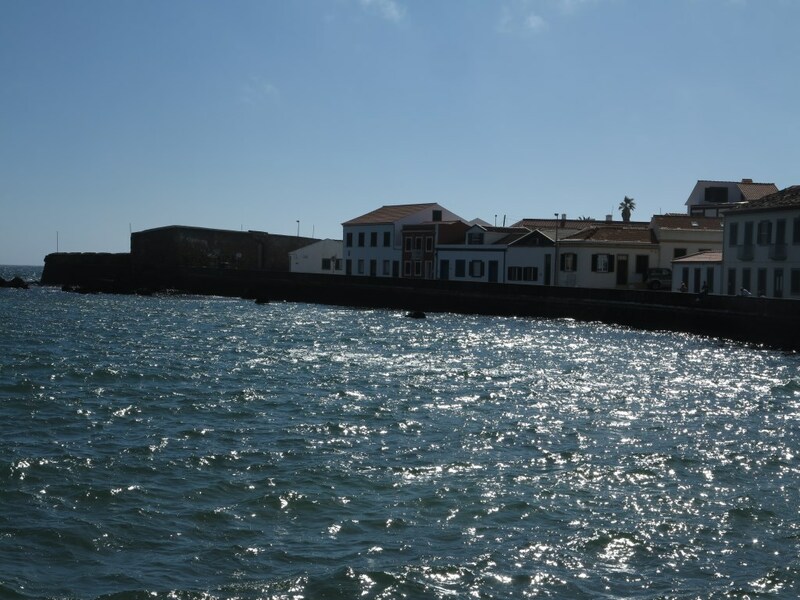 On the way, we stopped into the visitor centre at Capelinhos, where the history of a recent volcanic eruption (1957) is recorded and you can wonder around the significant new land formed by the eruption, but the rain disuaded much exploration outside! 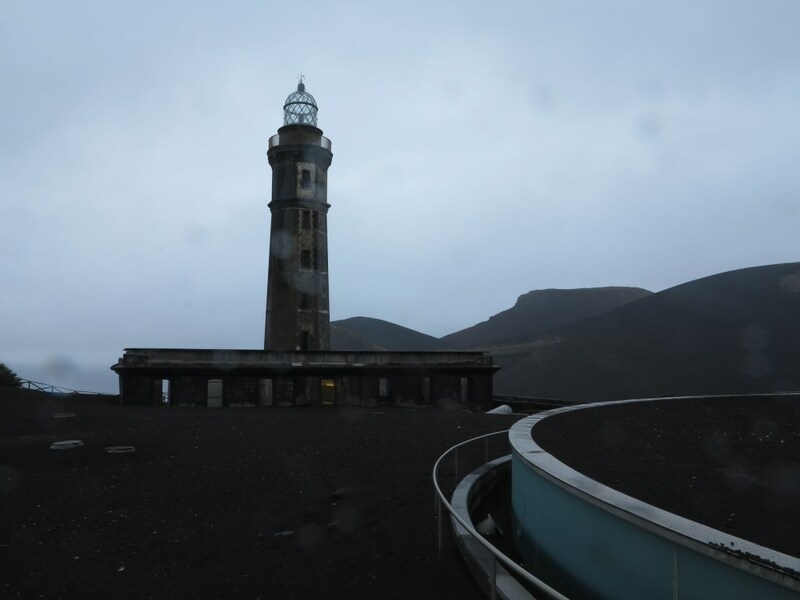 The old lighthouse - The keeper stayed at his post throughout the eruption! With time to spare, we then went most of the way around the North coast, too, returning back for dinner. 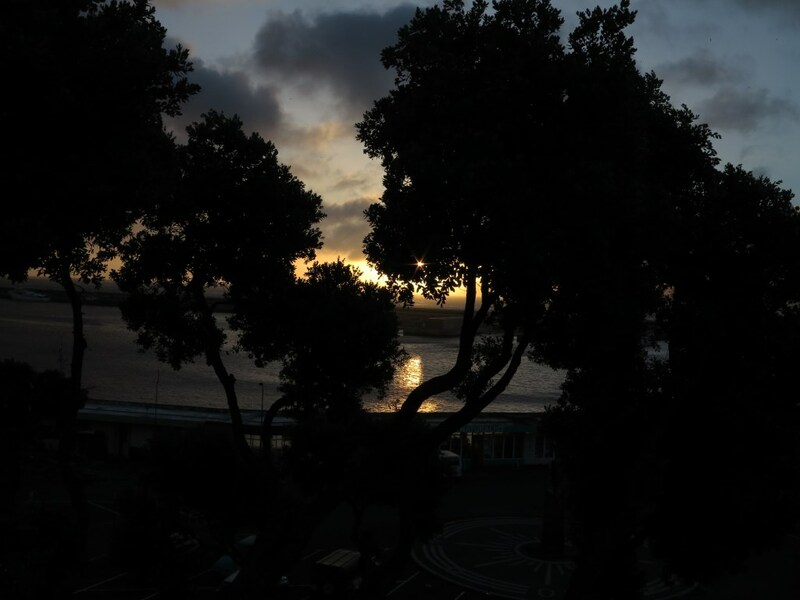 The next day, we were up early to catch the Ferry at 8:30, but as it's only around 5 minutes drive from the Hotel to the Ferry, it wasn't that early a start! The sun was out as we crossed to Pico and drove off into the countryside. Initially we found ourselves behind a couple of large lorries on narrow, twisty roads, so we followed a sign to a Grotte (a cave). Eventually (After some guesses) we found it and as it opened a few minutes after arrival, expected to go straight in. However, the tours were fully booked for hours and we would have to come back in the afternoon to visit it, so we decided not to bother. We followed some more smaller, inner island roads, many lined with Hydrangeas and Ginger Lilies, before rejoining the main coast road. 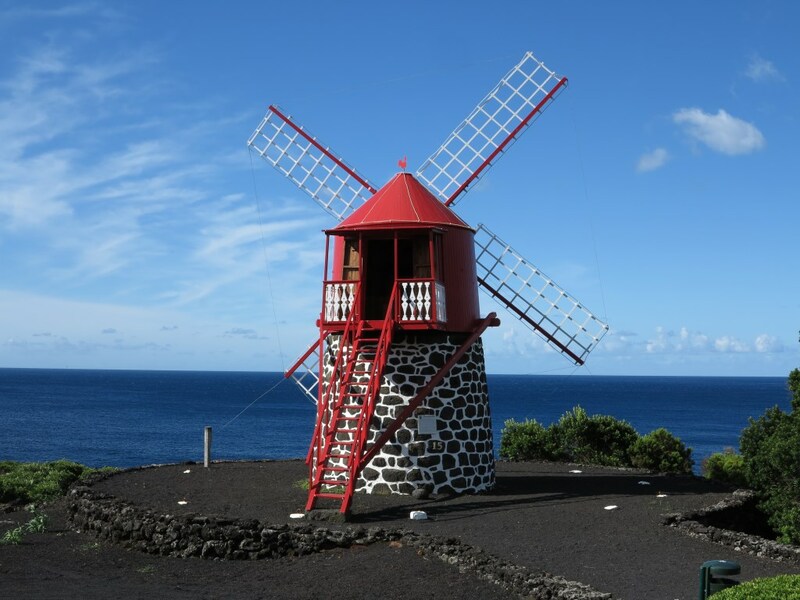 Typical Azorean windmill, this one a Tourist Informaton office. From there we drove more or less around the island. 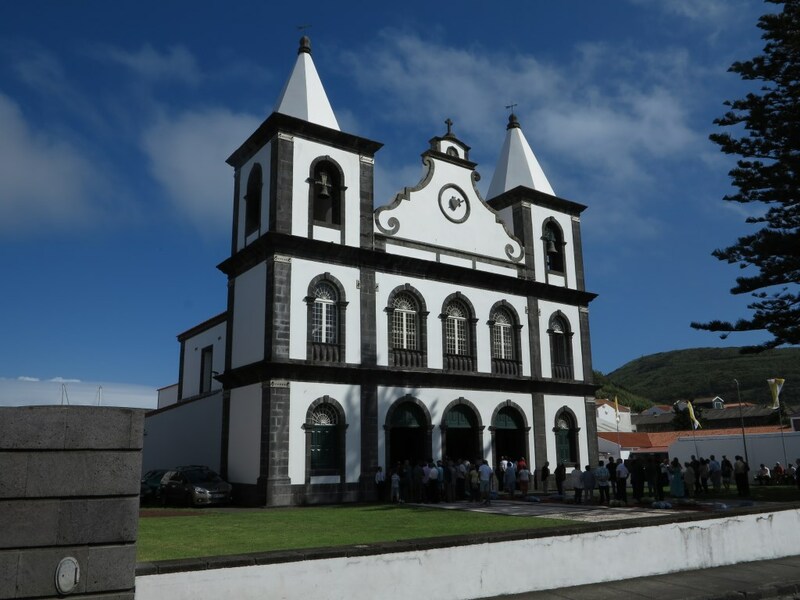 We stopped briefly to look at one of the typical Azores small windmills, this one doubling as a tourist information office and then headed on, Mandy keen to find a recommended pottery at the village of Piedade on the far eastern end of the island. We got there and followed signs to ‘the pottery’ (on foot at first, but then back to get the car as we seemed to be in danger of following the signs, in the heat, for miles!). When we got there we followed signs to a car park and got out, to be greeted by a woman asking if we were Mr & Mrs X (I forget now, but it wasn’t us!). We explained we weren’t them and were looking for the pottery and the woman apologised (unnecessarily, she was perfectly polite!) and pointed us towards the pottery run by her Mother and Father in Law. Her accent certainly didn’t sound Portuguese, so I asked where she was from. It turned out she was French and her husband (and in-laws) were Belgian! They run a small accommodation there and, frankly, it looked a lovely place to stay if you’re after something quiet with lovely views and a nice pool! We looked around the pottery, but it didn’t have what we were after an continued on. A little while along the road, I spotted a sign for another pottery and we visited. Again, it didn’t have what Mandy wanted but we bought a couple of items and found out this one was run by a Dutch woman! Clearly Pico attracts people from all over! 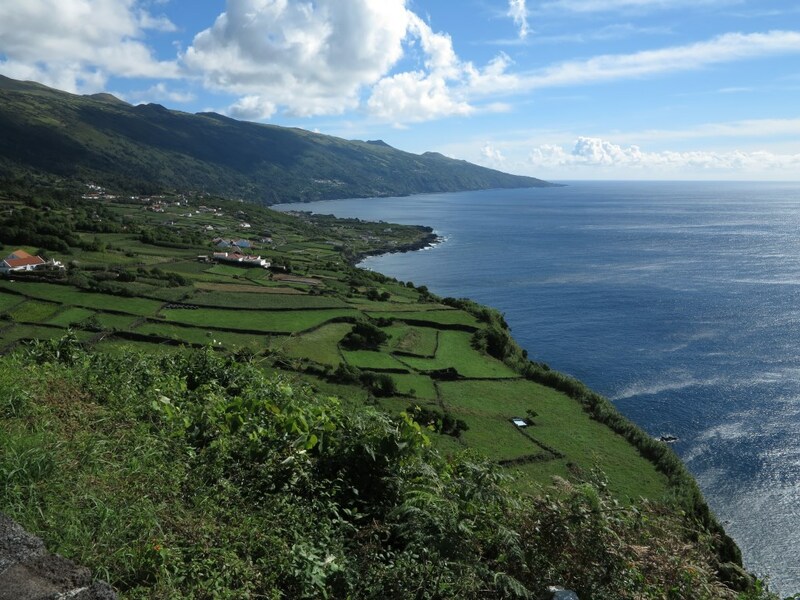 We continued on around the island, stopping a few times to admire the view over the nearby island of Sao Jorge, mindful that we had to be back in time to get the 18:00 ferry, which Mandy insisted was the last one, but I wasn’t so sure. 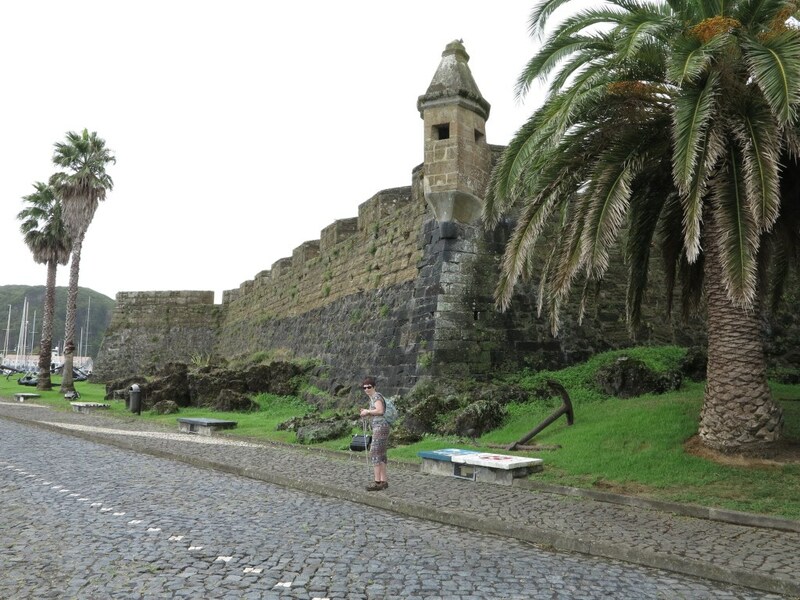 Still, it was the one we were booked on, so we made sure we were back in Madalena by 16:00. We had a quick beer and looked around, but there’s not a lot to see or do here and we soon got bored, so went back to the car and headed back out of town. 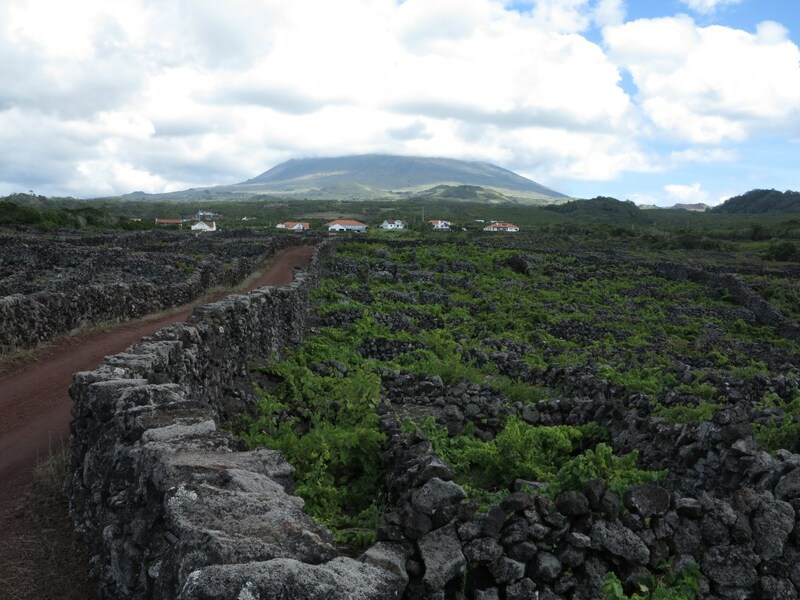 We spotted a sign that said something about “Wine” and “World Heritage” and headed off, expecting to find a visitor centre for the local vineyards, but we immediately found ourselves on dirt roads between low dry stone walls of volcanic rock surrounding tiny enclosures of vines. 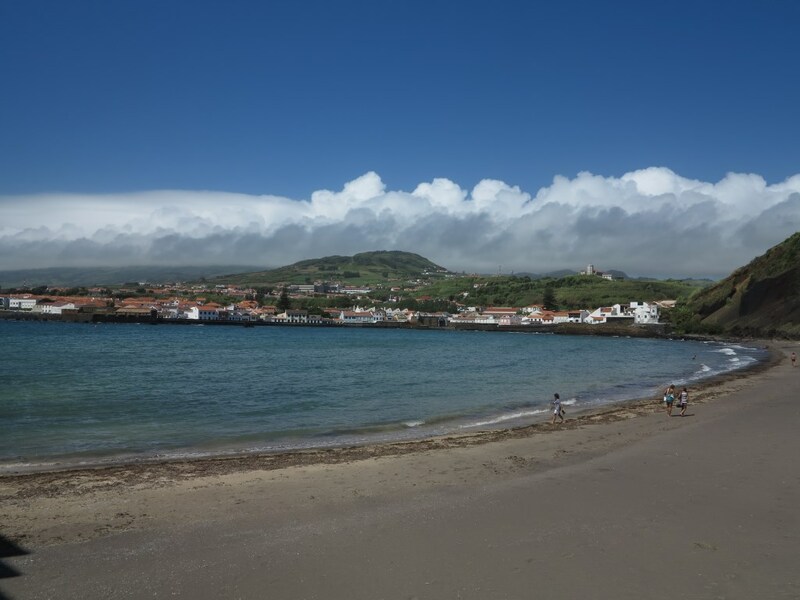 We worked our way back along the south west coast of the islands, visiting a few little beaches and buying an ice cream as we enjoyed the views back to Faial. 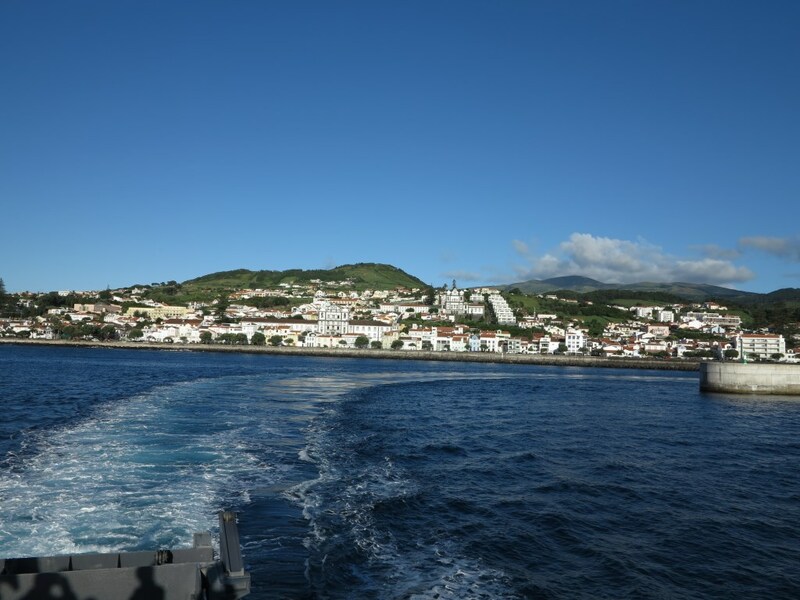 Eventually it was time to return to the ferry and we were soon back in Faial. Over dinner I spotted the sunset looked pretty good, so before it (and our wine) went we nipped out to admire the view as the sun set from the top of the hill overlooking the beach in Pico. The next day, was clear and bright and I was planning to dive with Blue Sharks in the afternoon, whilst Mandy took the car to one of the Forests. First off, though, we headed back up in the hope of seeing the Caldera that had been so comprehensively shrouded in cloud a couple of days earlier! 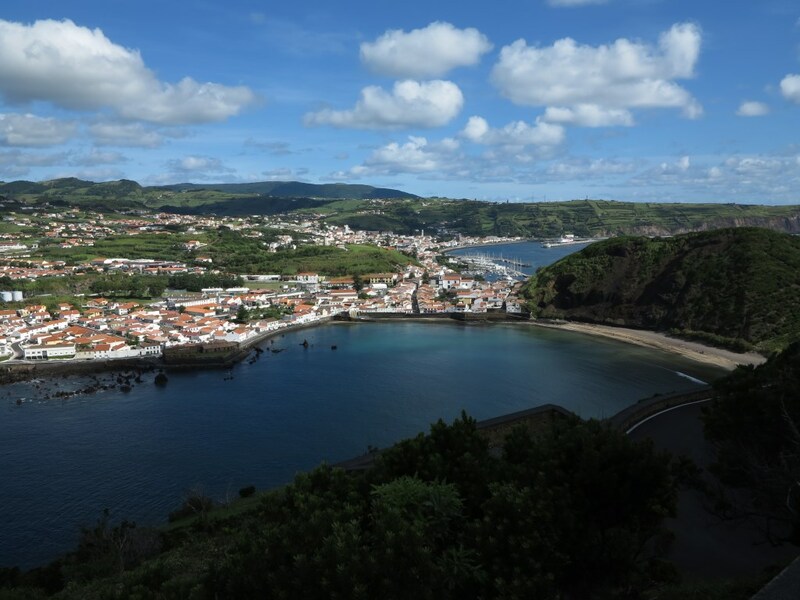 After a false start that took us to another hill (Monte Carneiro) overlooking Faial, we made our way up and were greeted by a little wind, but clear views both into the caldera and out over the island. YES!!!! All of Pico, well as near as we got! We headed back down after a while and, stopping at a few Miradoro (viewpoints) along the way, including the one with the large cross and statue above Horta, which afforded lovely views of the town and the other way, across Almoxarife, we returned in time to have the near obligatory daily ice cream and then to go our separate ways for the afternoon. The islands really are lovely when the sun shines! The following day was the Manta Ray trip out to Princess Alice Bank. We left at around 9:00 for a 3+ hour trip (45 miles) out to the spot seemingly in the middle of nowhere, where a seamount rises from the seabed 100s of metres below to ‘just’ 40 or so metres, which channels life to the surface and attracts Manta and Mobis rays in great numbers. As with the sharks the previous day, this was a great day for diving, although Mandy was, unfortunately, quite sea sick after snorkelling during the first dive, but she did see some Mantas and we had a large pod of dolphins entertain us for a while on the way back. Sadly, though, it has put her off the idea of spending a week on a liveaboard! We finished off our bottle of wine from the previous evening over dinner. 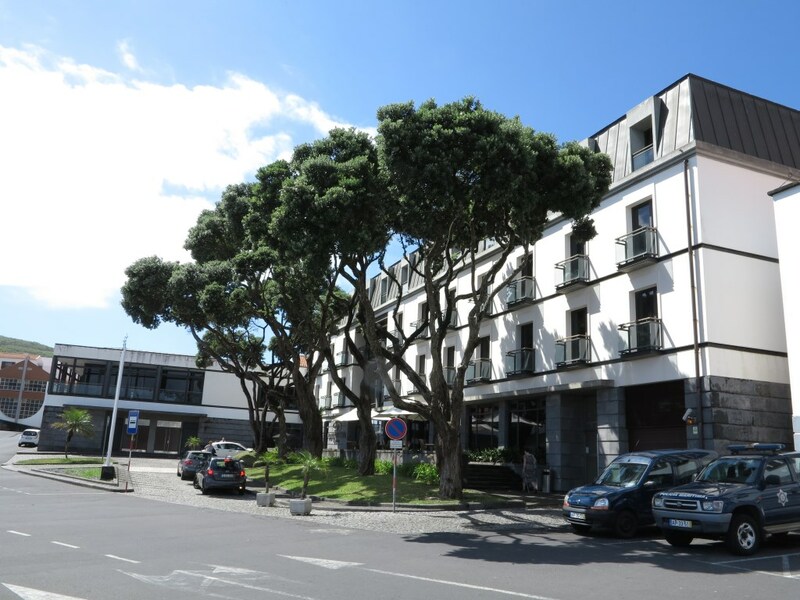 The food was always good in the Hotel Do Canal and, whilst it’s not exactly characterful, it’s comfortable, well located and clean, so it served us well for the week and we’d stay there again without hesitation. The next day, we packed and checked out, leaving our luggage, less most of my dive gear which I hoped was drying out at the dive centre still! We made our way, in rain again, around town, visiting the art exhibition in the library that featured the work of a woman who had been free-diving with the blue sharks when we were there (Lucia Debrito Franco). We also found the Horta museum which was pretty eclectic, but interesting, featuring exhibits relating to early flights across the Atlantic and the technology and history of ‘cables’ which Horta was once an important junction in for messages travelling across the Atlantic in the days before satellite communication. We had a pretty good burger and a beer as the sun tried to, but never quite succeeded in, break through the clouds then went back and collected my dive gear (very nearly dry - I was worried it would be very wet still and I’d be over the luggage allowance). Raquel picked us up in a tatty pickup, making her Uno look a bit luxurious, and took us back to the airport. 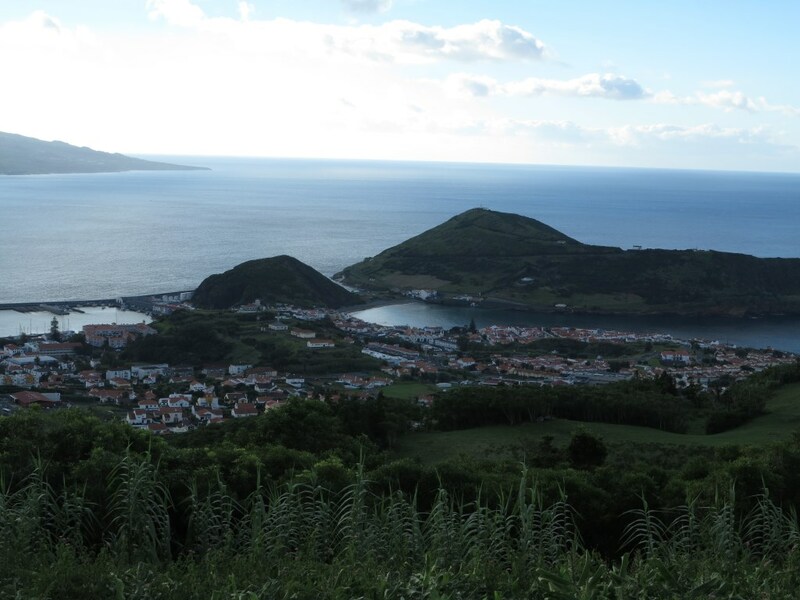 Horta from Monte da Guia, yet another volcanic cone in Faial! 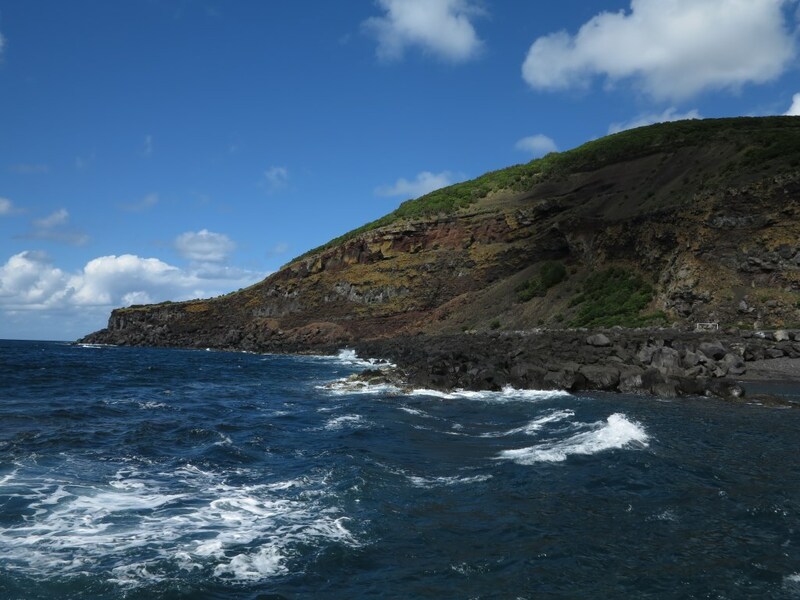 We’d really enjoyed our week in Faial, the diving had met (and exceeded) my hopes and the scenery and tranquility of the islands certainly captivated me. 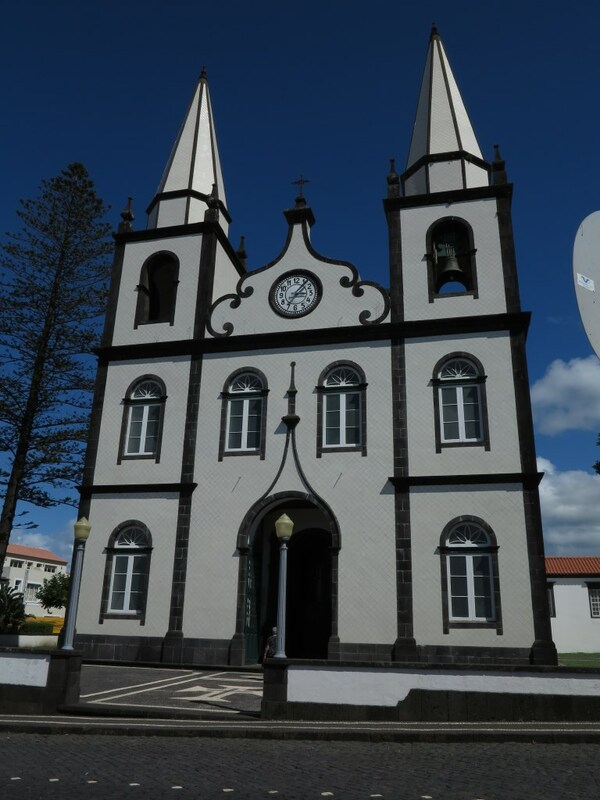 I could actually see me living here, assuming I could master Portuguese! I’m not sure Mandy was quite as enthusiastic, but I think she’d enjoyed it. Read more about our trip.